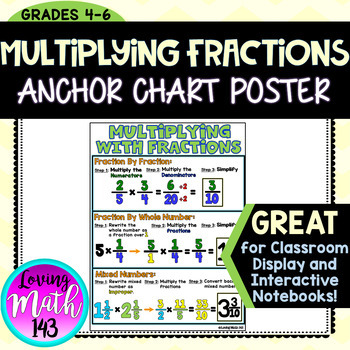 This anchor chart poster is a great tool to display in your classroom or hand out to students to put in their interactive notebooks and/or binder. Students will be reminded how to multiply a fraction by fraction, a fraction by a whole number, and multiplying mixed numbers. For each type of problem the steps are listed and an example is provided.